1. Housing bubble department: Switzerland, Australia. 2. Deflation, the zero-lower-bound, and multiple inflation equilibria, eurozone edition (this is a straight application of James Bullard's earlier paper, which in turn is an application of a paper by Benhabib, Schmitt-Grohé, and Uribe). Hat tip to Gavyn Davies, at the FT, for the link. 3. Puerto Rico will default (most likely), by Felix Salmon. 4. U.S. labor market spider chart. Great visual tool by the Atlanta Fed. Don't miss the jobs calculator, and the inflation dashboard! 5. 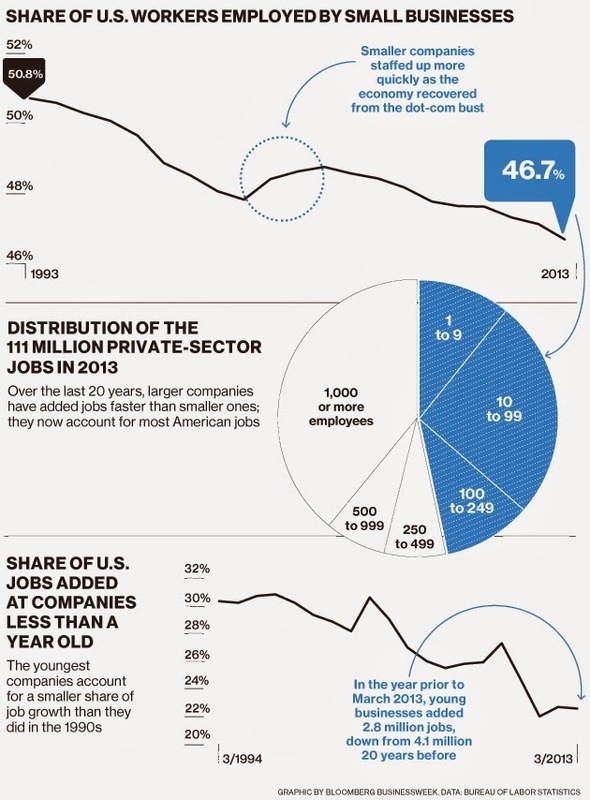 U.S. small businesses don't create jobs any more, from BloombergBusinessweek.